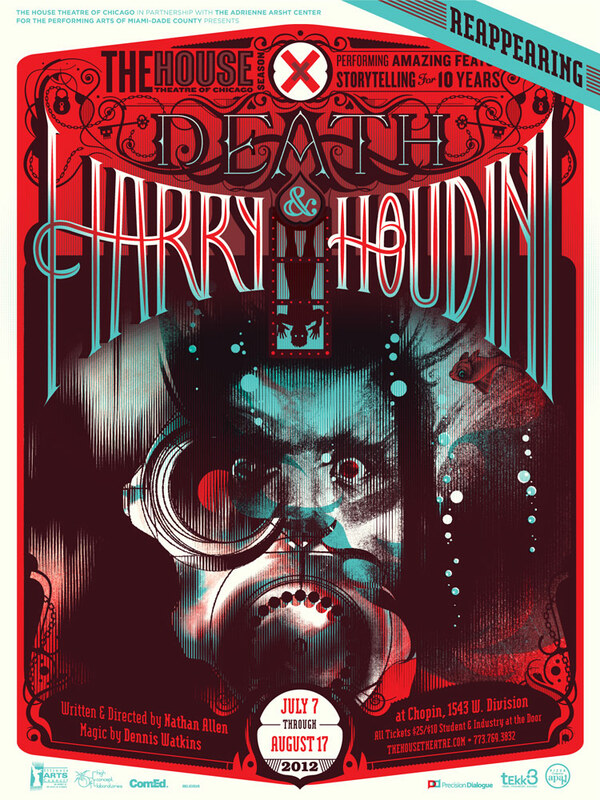 The House Theatre's smash hit, Death and Harry Houdini, reaches the end of it's final extension today. This is, without a doubt, one of our favorite shows of the year. We published this interview with the show's lead, Dennis Watkins, back in the spring on Facebook and Twitter, but want it to live on in a searchable archive form, so we're breaking it back out at both ChiIL Live Shows.com and ChiIL Mama.com to celebrate the show's close. It was our great pleasure to be invited to Dennis' lovely northside home. His passion for magic extends from the stage to his after hours, where he surrounds himself with vintage magic props that have been in the family, collector posters of renowned magicians, and even a Houdini coffee table volume. Check out "the magician's lair" here. We got a rare peek into the home of magic man, Dennis Watkins, star of Death and Harry Houdini, The House Theatre's smash, sell out hit. 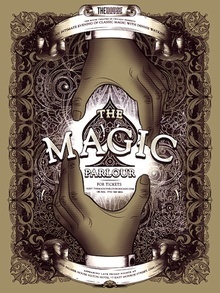 His love of magic goes beyond his roles in Magic Parlour and Death and Harry Houdini. He's a 3rd generation magician whose home decor includes vintage tricks from his Grandfather's shop and sweet magic show posters, for his own endeavors and others. A big show banner from The House Theatre's first incarnation of Death and Harry Houdini 10 years ago, hangs just inside his front door. 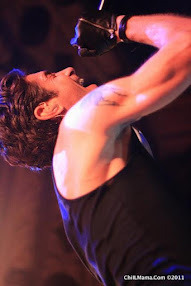 In our interview, Dennis expounds on the history of the show, Death and Harry Houdini, and it's numerous reincarnations with The House Theatre since 2001. He gives insight into how to prep for the physically and mentally challenging role and how being successful at illusion isn't about ego and mastering trick, but it's all about the magic and wonder going on in the audience's heads. 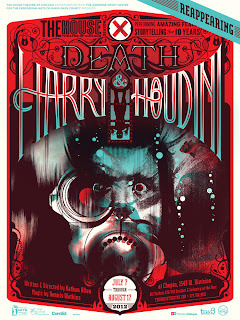 My husband and I caught Death and Harry Houdini opening night and loved it so much I spent months trying to buy tickets to take the kids back to see it. The run originally sold out in minutes, and although I was stalking their Facebook page, every time a trickle of tickets became available, they got scooped up before I could get my finger on the button. We finally scored a block of tickets and my kids were able to see the show for my son's March birthday, with one of his best friends. 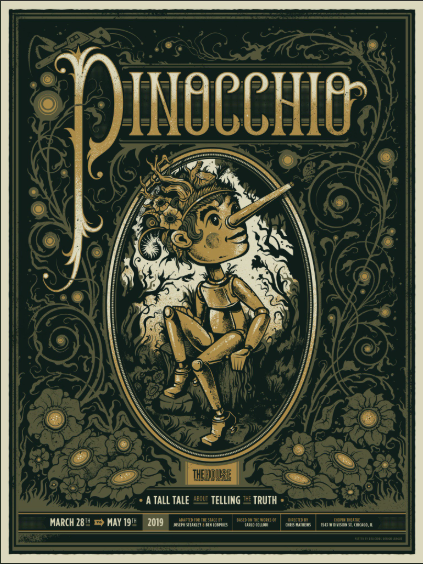 As I'd expected, the kids were enamored with the show and amazed with the acting and the illusions. We all sincerely hope that this is not the last we've seen of Harry Houdini, skillfully brought back to life by Chi-town's own magician extraordinaire, Dennis Watkins! 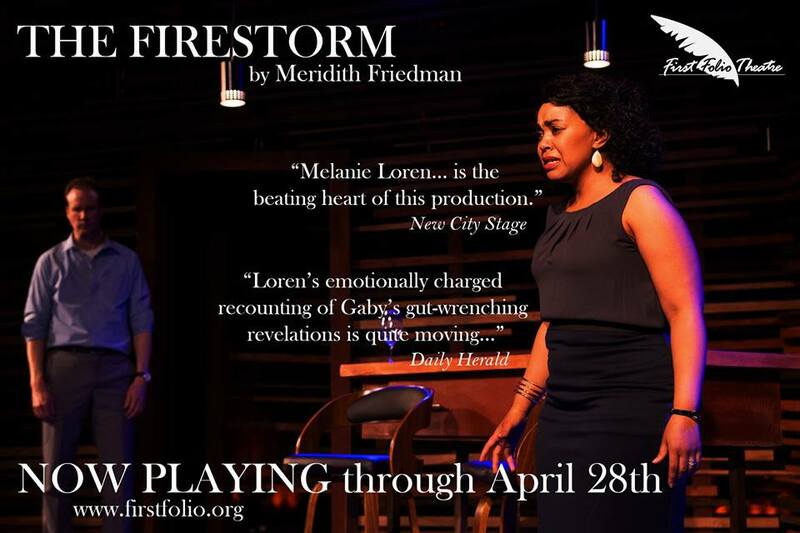 We've seen numerous productions by The House Theatre over the years and they do not disappoint. We highly recommend you check out their 11th season. From the writer/director of ‘Death and Harry Houdini’ comes a new epic journey filled with heated battles and life-size puppets. Our unsuspecting hero, Casper Kent, is the son of a poor farmer. When an old storyteller reveals that Casper is the rightful heir to the throne, his life is threatened from all sides. Young Casper must escape the rebels, choose compatriots and question what is good and right for the land. Join him on his quest to lift the magical hammer that will unite or destroy them all. "A sophisticated night-cap. You’ll be mightily impressed! " “A perfect evening of illusion and laughter… The Magic Parlour transformed a roomful of tired adults into wide-eyed, wide awake innocents. And that in itself is Watkins’ most impressive trick. The Magic Parlour every Friday night at The Palmer House.